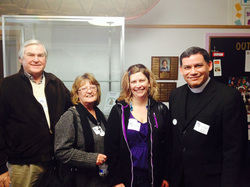 Pastor Jack Ericson, Alice Person, Marcie Vallejo, and Rev. Jose Luis La Torre-Cuadros who is Assistant to the Bishop,Sacramento office of the Bishop,Sierra Pacific Synod- ELCA attended a LEAN meeting in Reno. LEAN -- Lutheran Episcopal Advocacy Network in Nevada. Through the Policy Council we work to activate a statewide network of individuals in all ELCA congregations. Lutherans believe that through baptism, we are all called to be wise and active citizens who have a responsibility to defend human rights and to work for freedon, justice, peace, environmental well being, and good order in public life. Find out what is happening at the Sierra Pacific Synod of the ELCA. Check it out! Looking for church supplies, Bibles, Bible Study books? Find anything church related here.